This might not be news just in, but pointing and laughing at The Mission back catalogue – it’s not what is generally known as a taxing endeavour. Live, on record, at the bottom of a bottle, and let’s throw some expressions around. Pompous, melodramatic, overblown. Silly-hatted, patchouli-scented, racked with earnestness when they shouldn’t have been, yet riddled with blokey humour when an excuse for serious posture arose. And that’s without mentioning the lyrics. Cliché is by its very nature omnipresent (and no doubt omniscient, too); start digging pretty much anywhere, and you’ll have a stack of it the size of Wayne Hussey’s late-eighties ego in no time. The key to cliché is knowing how to handle it. How to cadge a lift on its contrails, then – more importantly – when to leap off. Lyrically, and this was something Hussey never grasped. The other day in the LGM garret, attentive eyes tried to watch John Boorman’s Excalibur, based almost entirely on some vague memory (mine, aged fifteen) of it being a spellbinding experience; it was awful. Gloopy, supercilious, entirely up its own derrière; “make it stop”. “This is like a Mission LP,” someone may have said. And when the vocalist has a gob full of cod Le Morte d’Arthur gibberish amidst all that cheap red wine Hussey favoured, you can very much see their point. New Age hokum crossed with the type of fantasy novel dialogue written by a confused teenager hoping to impress with the fact that they’ve read a book or two. Real women don’t populate The Mission universe; they’re all romanticised silhouettes dancing with chiffon scarves against the moonlight (‘Severina’; ‘Fabienne’), and whilst that particular criticism can be laid at many a door (Iain Banks’ protagonists were always idealised versions of himself, the love interests invariably one-dimensional versions of the alluring femme), such constant Courtly Love twaddle grates regardless of media. The Mission’s earlier albums – from Gods Own Medicine (1986) through to ‘92’s Masque – and they’re riddled with this dreamcatcher and crystals configuration of Goth rock trope. I’ve written about Goth before – here, in fact: The Looks and the Lifestyle – Exploring the Sounds of Autumn Goth – so no need to revisit conversations around what it is does and doesn’t entail; suffice to say that The Mission were on the softer, melodic side of the scale, with their most successful LPs – Children (produced by Led Zeppelin bassist John Paul Jones) and Carved in Sand driven as much by the sentiments and configurations of American rock (for example, the cover of Aerosmith’s ‘Dream On’) as funereal lounging and too much dry ice. A single such as ‘Butterfly on a Wheel’, and there’s a measured, meditative quality. It’s not helped by Hussey’s voice being too robust for the softer moments, or the usual, hackneyed lyrics, but the track does suggest that there’s something else present other than sub-Sisters of Mercy nonsense and My First Book of Arthurian Legend. These days, and I don’t drink snakebite and black or get stoned to Mike Oldfield records; such recreation, and they’re rites of passage, like listening to The Doors in the sixth form common room, or hitch-hiking to Newcastle or Brighton to see a band you’re not sure you like but who nonetheless had a decent write-up in that week’s Melody Maker. My copy of Gods Own Medicine (with the spoken, “I still believe in God, but God no longer believes in me” intro to opening track ‘Wasteland’), and the CD case is empty, disc presumably buried elsewhere in the dark, dusty alcove where The Mission records dwell. From Masque onwards (and to my surprise I appear to be the proud owner of Neverland (’95) and Blue (’96) – I gave up after that), and the sound grew increasing pastiche, littered with failed attempts at stylistic relevance which themselves now sound comically dated. Constant line-up changes – particularly on guitar, where Simon Hinkler’s first exit had the band floundering for sound – and…well, I’m arguing myself into a corner here that the band have never been worth the effort wretches such as me afforded them, back in the day. When as I remember it, those snakebite and black years were heavily soundtracked – by Children in particular – and just because time has not been kind to The Mission’s output, it shouldn’t open the door for revisionism by default. There must have been something about it, right? Digs out Children, presses play. What year are we in, again? 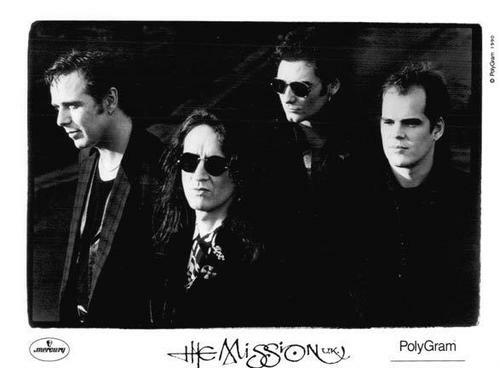 Light those scented candles, the playground samples and insidious chords of ‘Beyond the Pale’ are kicking in (that’s always one thing you could rely on re: The Mission – each lengthy intro gives the listener plenty of time to put the kettle on). It’s not until the 2m20s mark that the song begins; “Cast me adrift and set me to sail, just one last kiss before raising hell” – okay, but just the one kiss. All About Eve’s Julianne Regan on backing vocals there; nothing says Goth-lite better than a Regan harmonising. ‘A Wing and a Prayer’ is all gypsies and crossed palms, mercifully only half the length of the opening track, whilst ‘Fabienne’ and its big, big riffs and synthesised strings… hold on, the kettle’s boiled. So much for an objective listen. I did skip the third and fourth tracks from the above synopsis, for that’s where the album’s engine is very much located. ‘Heaven on Earth’ and ‘Tower of Strength’ work as an interesting double-punch, all tabla percussion, twelve-string evocation and smoky, longing vocals (plus neither feature bass guitar until the hypnosis of the latter’s dénouement). There’s an embracing texture behind both songs, and that’s the moment when I sense the wastrel I used to be standing at my shoulder (with his multi-coloured dreadlocks and “Coming down the pub?” smile). Let’s get drunk on cheap booze, crack out The Eight Legged Grove Machine, and go diving in the earnestness of it all. No, let’s not. You see, that’s the problem with nostalgia, and I don’t want to be eighteen or nineteen again (except for the booze prices, and maybe the opportunity to have seen Slowdive in a tiny venue). Around 1,000 times more gothic in anything other than standard understanding, that. I was just packing up my vinyl to ship it to the UK yesterday and fondly glanced at my Mission/Sisters collection. Those first 3 or 4 Mission singles were magnificent, sub-Sisters goth pop/rock songs. Serpents Kiss, Wasteland and Over the hills. Some great B side covers too, loved their Dancing barefoot. I bought the first three LP’s (I think) and don’t thing I ever listened to any off them in the entirety. I saw them the one time they came to New Zealand, made more sense live. ‘Dancing Barefoot’ – sure takes balls to cover something so indelibly linked to the original artist.